Where Do Foxes Find Food and Live During the Winter? When wintertime rolls around, many animals use their own unique techniques to seek shelter from the cold weather. 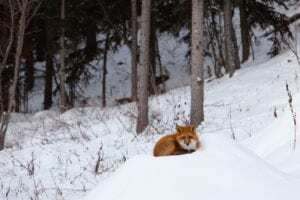 Even though some animals venture out into the frozen tundra in search of food, few are more commonly associated with the winter months than the fox. Perhaps due to the contrast of the sleek orange fox against the white winter landscape, foxes are animals of winter, but they do have a few tricks up their sleeve to stay warm during the winter. Of course, foxes do not hibernate like some animals. Instead, foxes grow warmer coats of fur to combat the cold temperatures and certain types of foxes have shorter noses and legs in order to conserve energy from things as simple as breathing and walking. During warmer months, foxes tend to prefer peace and quiet and mostly steer clear of humans. Foxes are far more likely to run away from potential danger than meet it head on, especially in terms of a larger human. However, as shelter and food quickly become less accessible during the winter, foxes begin to creep closer and closer to human settlements. Diet-wise, foxes are omnivores. Small animals such as lizards, rats and rabbits make up much of a fox’s diet, with birds, fruit and bugs also being potential meal options for the animal. Foxes are talented and smart hunters, and if they manage to find or hunt down a larger animal, they will store the dead animal and conserve food. However, food is not easy to come by during the winter, which helps bring foxes close to homes and businesses, where there is likely to be more food available. Additionally, foxes seek refuge from the cold weather by retreating into their burrows or dens. Not all foxes will dig in the dirt for shelter, as many will create living spaces out of rocks or forested area, but if push comes to shove for a cold fox, they have the tools needed to burrow into the earth and make themselves a home. When creating these burrows and venturing out for food, foxes pose little risk to human safety, but are certainly a nuisance for the well-being of one’s property or for the safety of one’s pets or animals. Hungry foxes are known to attack very small or newborn cats or dogs, because of the easy nature of overpowering the small animal. If you notice a fox near or on your property, call the experts at Shumaker Animal Control to deal with the problem for you. Our experienced team will take care of the problem in a timely manner, ensuring that your home, property and pets are not in any danger. Call us at 443-854-8072, visit our website or fill out the form on our contact page for more information. This entry was posted on Wednesday, January 30th, 2019	at 2:04 pm	. You can follow any responses to this entry through the RSS 2.0	feed. Both comments and pings are currently closed.